Abodi believes Italian football requires significant improvement and wants a more “transparent and modern federation.” Abodi stepped down from his position in order to campaign for the FIGC job. He faces current president Carlo Tavecchio, who won the last election despite making a racial comment when addressing the subject of the lack of playing opportunities for young Italians at the pro level. Nonetheless, Tavecchio had enough support to defeat Demetrio Albertini. This time he faces a more seasoned opponent in Abodi. However, experience has shown that the vote for the presidency is strategic and based on alliances more than on a candidate’s platform. It is for this reason Tavecchio remains the favourite to be re-elected. There are seven groups that are involved in the voting, each with an assigned number of delegates. Not all delegate votes are treated equal, however, as some of the votes of certain groups carry more weight, while others less so. 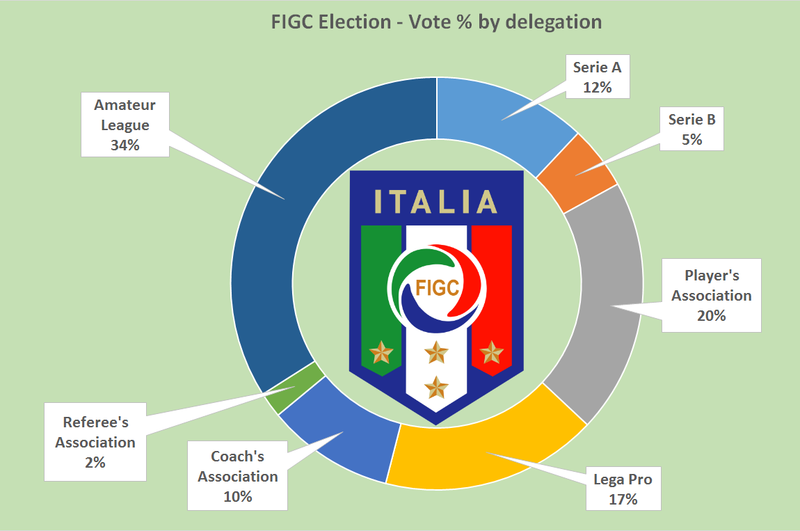 As you can see in the chart, although Serie A (with 20 delegates, one per team) has 7% of the delegates, its vote counts for 12%. On the opposite end, a vote from a Serie B (21 delegates, or 8%) only counts for 5%. The new president is elected on first ballot only if he receives at least 75% of the vote. If not, votes are recast a second time, and victory is declared if the candidate receives at least 66% of the votes. Should that not occur, a final third ballot takes place, and only 51% of the votes are required to win. During the last election, the vote went to a third ballot, and in the end Tavecchio won the presidency with 63.63% of the vote. Juventus and Roma, clubs who are progressive and modern, were openly against Tavecchio. For the upcoming election, every group has already publicly announced which candidate they are backing, with the exception of the referee’s association. It is important to note that although a group can publicly announce which candidate they will vote for, every delegate can choose independently. It will be interesting how this vote unfolds. Do the majority of the delegates remain with the status quo and support Tavecchio, or will they opt for Abodi who represents a change of the guard for Italian football that is in dire need of reform?